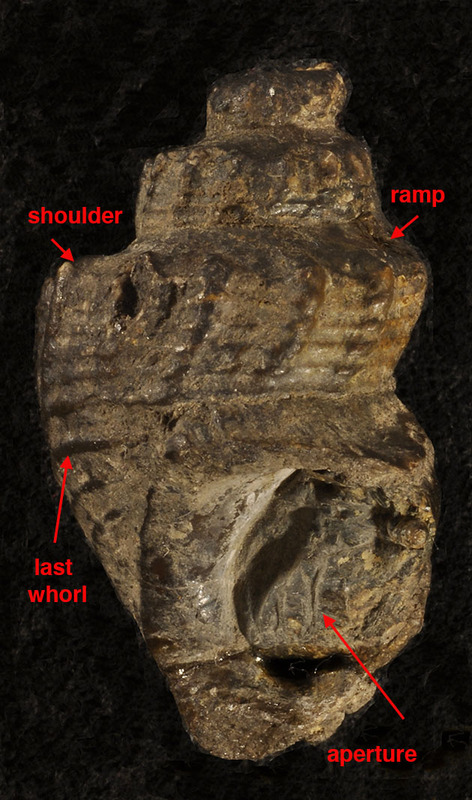 For many years, I have been intrigued by a fossil freshwater gastropod (snail) belonging to the genus Pyrgulifera, whose geologic range is Late Cretaceous to Eocene (i.e., from about 95 to 40 million years). In addition to its occurrence in North America (Wyoming, Idaho, and Utah), it is also found in Europe (e.g., Austria and France), Asia, and India. The morphology (shape) of Pyrgulifera reminds me of some shallow-marine gastropod genera although the resemblance is coincidental, rather than evolutionary. One of the best examples of this genus is Pyrgulifera humerosa (Meek, 1860), of Late Cretaceous age (Cenomanian Stage). It is an extremely common species, especially in the Bear River Formation near Evanston, Wyoming, in the extreme southwest corner of this state. Many varieties of this species are known. Back-side view of same specimen. Specimens of P. humerosa are generally well preserved although the margins of the aperture are usually crushed or broken off. The shell has a short-fusiform shape with several well defined whorls, concave ramp, angulate shoulder bearing several short spinose projections, and rather wide spiral ribs, especially on the last whorl. Species of Pyrgulifera lived in freshwater or fresh-brackish (<5% salinity) waters in coastal plain estuaries or lower courses of rivers.